Actor Nicholas Cage is an eccentric dude, but is he immortal? That’s the not-so-serious question floating around lately after an eBay auction grabbed some attention. The item up for bid is a photo of a Tennessee man who lived during the Civil War. No, it’s not a newly discovered tintype of Confederate general Robert E. Lee, but it is a near-exact twin of Cage. 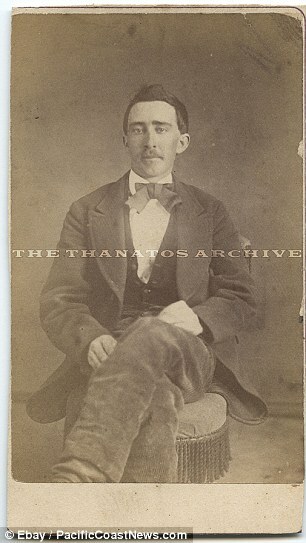 The seller Jack Mörd, of Seattle, Washington is asking a cool $1 million for the 4” by 2.5” carte de visite photo of Cage’s doppelganger taken around 1870. In a tale worthy of a plot in a Hollywood script, Mord has created his own back story for the photo and its ties to Cage. The photo’s owner “believes” the star of The Rock is a vampire who reinvents his life every 70 or 80 years, starting fresh with a new identity in a new location. Don’t forget Cage played a man who believes he’s turning into one of the blood suckers in 1988’s Vampire’s Kiss. Was he trying to tell his fans something about his past? Or is the old photo more like something his character in National Treasure would track down as a clue tied to a big conspiracy and ancient loot. He’s also had a fondness for buying castles. Were these former homes? They should check the wedding photos from the vampire-themed nuptials to see if Cage makes any appearances. Hmm, maybe Jack Mörd knows more than we though. With Cage, I think anything is possible, but the story does make for some fun daydreaming and scheming.